Published on June 16, 2012 in Dinner at Home, Gluten-Free and Low-Sodium. Closed Tags: curry, thai, tofu, vegan, vegetarian. We can thank my Aunt Treva for this delicious curry recipe and for turning me on to cooking Thai food. Makes 4 servings. Stir-fry the broccoli and carrots in oil for 3 to 4 minutes, but make sure they stay firm, since they will continue to cook in the sauce later. Set aside. Combine coconut milk, sugar, yellow curry paste and lime leaves in a wok or large skillet over medium heat. Cook for 5 minutes or until the coconut milk begins to thicken. Add chopped mint, juice of 1/2 lime, broccoli, carrots and tofu. Cook at a low simmer for 5 to 10 minutes to let the flavors blend together. Serve with brown rice and additional lime wedges. Add 1/2 cup chopped pineapple when you add the tofu. If you use pineapple, you might want to reduce or eliminate the sugar. Pre-bake the tofu if you want it to be a little more firm. Can easily be made gluten-free. 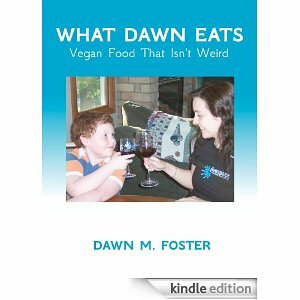 Published on March 31, 2012 in Big Pots of Soups and Stews. Closed Tags: basil, lentil, soup, tomato, vegan, vegetarian. This is one of my favorite soups. 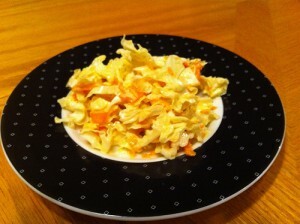 It’s delicious, quick and easy to make, which is the ideal combination for my busy life. 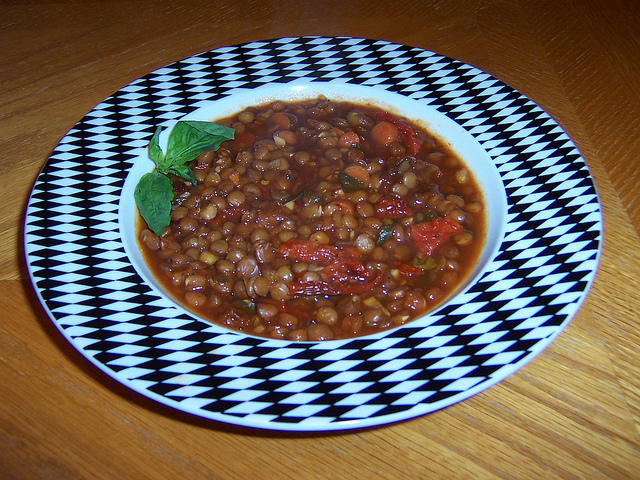 The real secret to this recipe is the sun-dried tomatoes, but you really can’t go wrong with anything based on tomatoes and basil, and as an added bonus, the lentils make it a hearty soup. Makes 4 to 6 servings. 1/2 cup reconstituted, chopped sun-dried tomatoes. Heat oil over medium heat. Add onions and sauté for 2 to 3 minutes. Add all other ingredients and bring to boil. 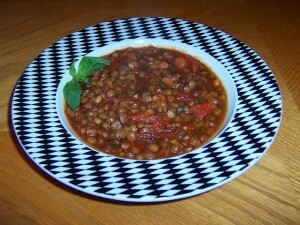 Reduce heat to low and simmer for 35 to 40 minutes or until the lentils are tender. Add 1/2 cup rice and an additional 1 cup water. Experiment with additional spices. Oregano and thyme would make good choices. Make a spicy soup by adding some crushed red pepper or chopped chili peppers. Add a few mushrooms, broccoli or other vegetables. Naturally gluten-free and can be easily made low-sodium by substituting water from reconstituting the sun-dried tomatoes in place of the vegetable broth. 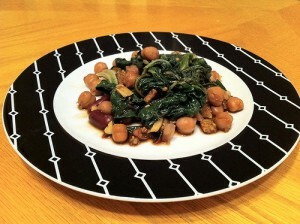 Published on January 4, 2012 in Gluten-Free, Hearty Side Dishes and Low-Sodium. Closed Tags: potatoes, roasted. I love those cute little red potatoes! Despite the longer cooking times, this is a pretty easy meal to make, and you can always get a little work done around the house while it bakes as long as you remember to swing past the oven a few times to turn them. Makes 4 to 6 servings. Mix all ingredients (except for the potatoes) in a large mixing bowl and set aside while you wash and prepare the potatoes. Add potatoes to the olive oil mixture and toss to coat. Spread evenly on a baking sheet or pan in single layer with no overlap. Bake uncovered for 50-60 minutes stirring every 15 minutes. Add a handful of garlic cloves 15 minutes before the end. Add a few slices of onion. Experiment with other spices. Basil and oregano or sage would be good choices. 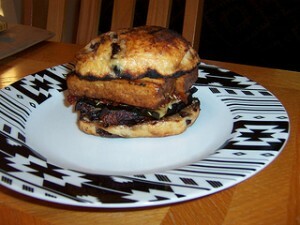 Published on December 23, 2011 in Ingredient Foods. Closed Tags: coconut milk, peanut, peanut sauce, thai. Use as a dipping sauce for fresh salad rolls, spring rolls, tofu or grilled vegetables. 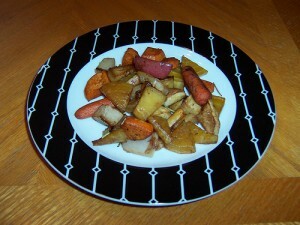 You can also use it as sauce for stir-fried vegetables and tofu. 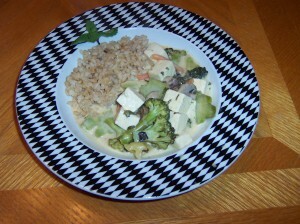 Serving it over steamed broccoli and carrots is a traditional Thai Pra Ram dish. Makes 4 to 6 servings. Warm the coconut milk in a saucepan over medium heat for 2 to 3 minutes while you assemble the rest of the ingredients. Add the chili paste and sugar. Stir to dissolve. Add the ground peanuts or peanut butter. Stir frequently until the peanut butter has melted and the sauce has started to thicken. If the peanut sauce is too thick, you can thin it with a little bit of water or coconut milk. Omit salt for a low-sodium sauce. Omit or reduce the sugar for a less sweet sauce. When using a sweetened peanut butter, I always leave out the sugar. Add more peanut butter for a little extra peanutty goodness. 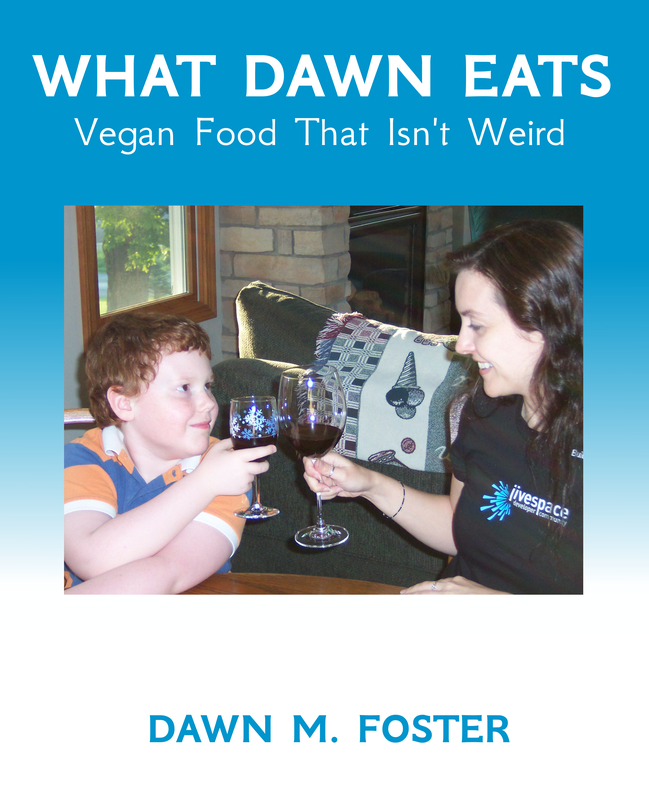 Published on December 21, 2011 in Gluten-Free, Low-Sodium and Potlucks and Parties. Closed Tags: cabbage, coleslaw. This is the slightly healthier vegan version of the coleslaw that you remember from the picnics and parties of your youth. Makes 6 to 8 servings. Combine all of the sauce ingredients in a small mixing bowl. Stir briskly or whisk until the sauce is smooth and creamy. Add more or less vegan mayo to taste. 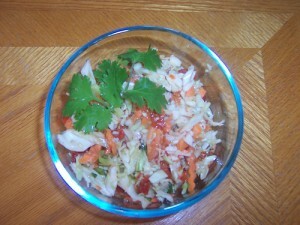 Shred the cabbage and carrot and place in a large mixing bowl. Stir in the sauce and toss together to combine. Refrigerate for a couple of hours before serving. Use a mix of green and purple cabbage for a little color. Add a few other vegetables for more variety. Omit the mustard and replace the celery salt with ground celery seed for a low-sodium version. Published on December 14, 2011 in Gluten-Free and Hearty Side Dishes. Closed Tags: beans, greens, tempeh. Fresh greens are so healthy and full of vitamins, so this is one of the dishes I make when I have been busy and not eating as well as I should. It makes a great dinner on it’s own or as a side dish. Makes 2 to 4 servings. Drain and rinse the can of white beans and set aside. Heat olive oil over medium heat and add shallots. Sauté for 3 minutes until the shallots have softened. Add tempeh and sauté for another 3 to 5 minutes until the tempeh begins to brown. Add garlic, greens and beans. Add remaining ingredients and cook for 2 to 4 minutes or until the greens are wilted, but still firm. Pictured with mixed salad beans, instead of white beans. Main Meal: Serve as-is or over a bed of your favorite grain. Experiment with a variety of mixtures of different types of greens and different spices. This is great with rosemary or basil, for example. 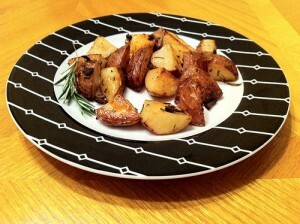 You can make a very simple version of this with just a little balsamic vinegar and some spices. Instead of the vinegar, serve with lemon wedges or add lemon juice for added flavor. For a low-sodium version, eliminate the tamari and tempeh bacon and use a low-sodium can of beans. This can easily be made gluten-free. 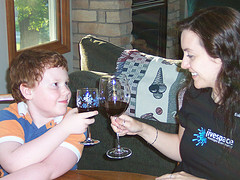 Published on August 2, 2011 in Gluten-Free, Low-Sodium and Potlucks and Parties. Closed Tags: cabbage, coleslaw, mexican. This looks suspiciously like my Thai Coleslaw recipe, but it’s different. Trust me. Makes 8 to 10 servings. 1/2 teaspoon adobo sauce (or other smoky hot sauce). Combine salad ingredients in a bowl. Combine dressing ingredients in a small container and whisk for 1 minute to combine. Drizzle sauce over veggies and toss to coat evenly. You might want to add a little more lime juice or vinegar to taste. Let stand at least 10 minutes or refrigerate until you are ready to serve. Toss again before serving. Replace carrots and red bell pepper with other colorful vegetables. Add some jicama for additional crunch.